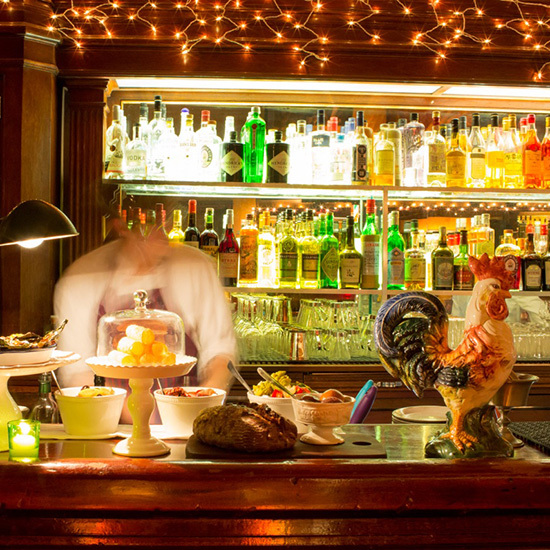 F&W's Kate Krader identifies the three best neighborhoods in America for a cocktail adventure. Sherry- and gin-based drinks are the specialties at the glassed-in bar overlooking the water at chef Michael Chiarello's new tapas spot. Pier 5, The Embarcadero; coquetasf.com. Jonny Raglin oversees this 1900s-style bar, which specializes in period-appropriate cocktails and snacks like corn hominy fritters. 155 Columbus Ave.; comstocksaloon.com. Whiskey aficionados will find a remarkable collection at Erik Adkins's bar, including an extensive list of allocated and out-of-production bottles, such as Buffalo Trace Hot Box. Pier 3, The Embarcadero; hardwaterbar.com. April Bloomfield and Ken Friedman recently restored this old-school Italian dive with beloved cocktails like the bourbon-spiked house cappuccino. 242 Columbus Ave.; toscacafesf.com. Best Bar Food in the U.S.